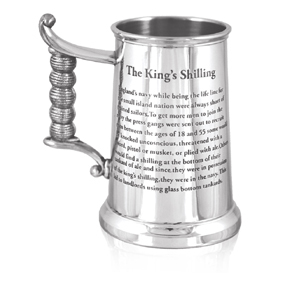 This is a 1 pint King's Shilling heavy weight pewter tankard. It has a straight sided body with a glass base with a shilling in base. On the tankard is the legend of why glass bottom tankards were brought into us. The text shown is ' The King's Shilling, England's navy while being the life line for the small island nation were always short of trained sailros. To get more men to join the navy the press gangs were sent out to recruit men between the ages of 18 and 55 some would be knocked unconscious, threatened with a sword, pistol or musket, or plied with ale. Others would find a shilling at the bottom of their tankard of ale and since they were in possession for the king's shilling, they were in the navy. This led to landlords using glass bottom tankards.' It has a rope grip handle and this tankard is a thicker gauge, so is heavier than standard tankards. It is 145mm high and 80mm wide.